Debut author Deborah Burrows has brought her skills as a historian to the fore with this meticulously researched and thoroughly entertaining novel of love and intrigue. Like most readers, I have my favourite types of books. 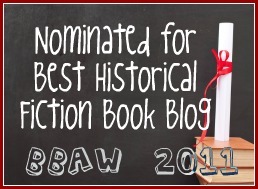 For example, tell me a book is set in either World War I or World War II then I will certainly consider whether it might be something that I might want to read. Tell me that book is set in my home town of Perth then I will have to do more than that! Of course, that bring it's own dangers. What if the representation of the city feels off? Luckily, that wasn't an issue here. Perth is a city that has been invaded, mostly by the American servicemen who have been based there as a flying base and also, to a certain degree, as a deterrent to a Japanese invasion. With them the US service men bring hard to find goods that can be sold on the black market, money and good times, especially for the young ladies in town. They look good in their uniforms, and they know how to show a lady a good time with music and dancing and more! Whilst Meg Eaton should be out living it up, she has been living a more low key life since she heard the news that her boyfriend had been killed. Her attempt to contact his parents has been shunned and so she grieves alone. She lives with her mother and older sister, and works as a stenographer at the Crown court. Her very quiet life is changed when, on a hot summer day, she overhears a conversation outside her house. When she goes out to investigate, she finds herself talking to her dead boyfriend's older brother, Tom. Tom is the quintessential war hero. He is handsome, decorated for bravery, former Rhodes Scholar and from a well known (and wealthy) family. He is, however, also fighting his demons as he was badly injured and is constantly in pain. He therefore can no longer take part in active fighting, but he has instead returned to Perth, with his glamourous fiancee in tow, to act as a liaison officer between the Australian and American forces that both call the city home. Tom and Meg had never actually met before the day that he visited her next door neighbour. Neither could possibly have known the impact that meeting was going to have, both immediate and long term. When they find a body, the police know who they need to find immediately. The dead woman's husband is an Italian and therefore must have a big temper. Meg doesn't believe that at all, and so it is therefore up to Meg and Tom to work out precisely what did happen to the woman. Once Tom realises who Meg is, and that she is still living a half life as a result of her grief, he is determined that it is time for her to start living and as a result he introduces her to some of the soldiers that he knows, and starts meeting her for drinks and lunch. The most difficult thing for Meg though is to see behind the charming exterior of the men that she is meeting to see the kind of men who are underneath, and that is especially true of Tom. He is keeping many secrets, not the least of which is what the true nature of his relationship with the dead woman was. The author did a great job of dealing with some of the social issues of the day. The husband's family has been interred as enemy aliens and yet he is off fighting for Australia. The dead woman is working at the local hospital and has a reputation for being a bit fast and so there are plenty of judgements made about her fate, and then there is the taste of animosity that exists between the Australian and American soldiers. Sometimes when an author tries to get good historical detail, a good romance and a good mystery into the one novel, one aspect or another is weaker, but Burrows has managed to get the balance pretty much right. Throw in the places that I am familiar with like the gardens near the court buildings and the foreshore of the Swan River among others, and some unfamiliar aspects of the history of Perth, and I was a pretty happy reader. Whilst I have that extra connection to the setting, I am sure that the setting will be enjoyable to most readers even if they aren't as familiar as I was with it. 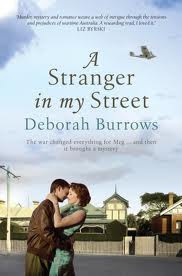 A Stranger in my Street is Deborah Burrows first novel and it is a really strong debut. I saw her mention the other day on Twitter that she has recently been signed for a second novel which will once again feature World War II and Perth, so I am already anticipating getting my hands on that book. Interesting blog, though I'm not sure about this particular book. This one sounds really good! Thanks for the review. PS - I also really like the new look of the blog. Sounds interesting. I love books about WWII in a point of view other than that of the US and ones that have active female characters.